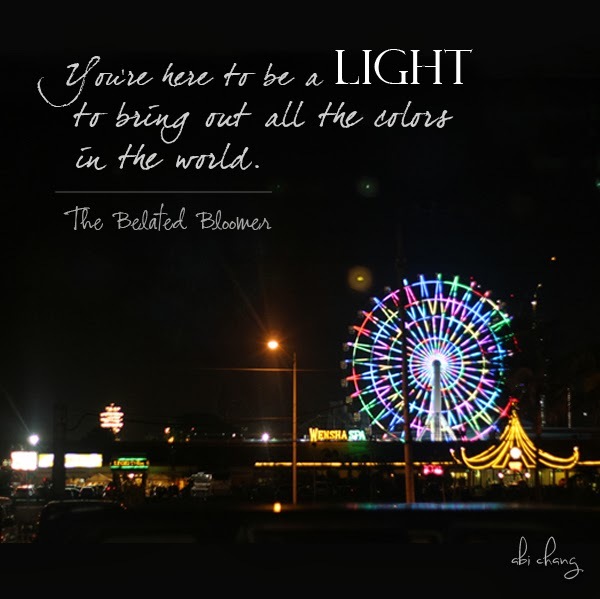 "You're here to be a light - to bring out all the colors in the world." I remember a lesson In life that my Philosophy teacher shared with our Sophomore class one lazy afternoon. He asked us to imagine ourselves holding a single, lit candle as we navigate through the hall of life, an intimidating place where the darkness knows no bounds. Sometimes, he says, our light shines so bright that we can share it with others and light their paths, and other times, it can be reduced to a small, flickering flame that we must protect from gusts of wind. Often, that light can only shine on the next few steps we take but we must keep on moving forward, even when we're not entirely sure where our steps could take us. As someone who didn't always have the healthiest of self-esteem, I know how fragile and vulnerable that light can be. There were times in life where I felt like my light was reduced to a smolder on the end of the wisp, but somehow, against all odds, it stayed lit. I tended to it, kept it under cupped hands until I was sure it had regained its strength and ready to face the world again. I then realized that my light needed constant protection from all the brutal forces of the world that threaten to snuff it out, and it is my job to keep it burning no matter what. If there's one thing that stuck to me that afternoon, it is this: Don't let ANYONE extinguish your light. That light is your self-worth, your hope, your dreams. It is you shining for the world to see. All of this is very much true and powerful. Lovingly, I use the alliteration of "Abi awesomeness" to describe you. You are awesome for more than just beautiful looks with this post. This is a beautiful message to offer to others. Something like this is really refreshing when more people care about putting others down and hating on everybody. Thank you for offering your motivation and your positive energy. Are you traveling to France and could use a portable French food dictionary menu decoder that will fit in a coat pocket or a purse? Do you just need a concise dictionary for those French recipes you make at home? The A-Z of French Food is a 4000+ entry, 142 page, lightweight, compilation of French cuisine gastronomy terms translated into English and augmented with explanations and historical anecdotes.